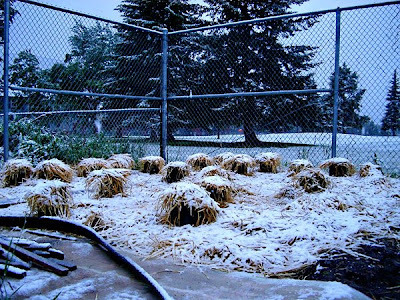 Underneath those pots with little haystack hair-do's dusted in snow are spaghetti squash and zukes and pumpkins and yellow summer squash. I wonder what the survival rate will be. Photo credit goes to the handyman. At 6 a.m., hot yoga sounded a heck-of-a-lot better than going out to the greenhouse to water and check the plots in the snow. It's June and I'm from Alabama. So there. These are cute. I learn a lot here.